The new project has been started. No, I won't tell you what it is. You'll have to come back as it progresses and see. No, I won't tell you whom it's for. Said person will just have to wait. 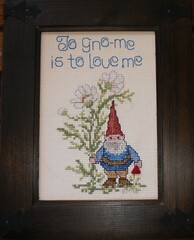 I have to go to the cross-stitch shop tomorrow, however. I am missing 2 colors and very low on a third. This is odd because I have 4, count 'em, 4 plastic bins of DMC floss, arranged in numerical order. Perhaps the 2 missing colors are in some forgotten project. At one point, I was buying, every time they were on sale, DMC floss in an attempt to have every color made. When you could get them 5 for a dollar, I'd buy $5.00 worth, hence the 4 plastic bins full of color. But, after a while, it seemed rather silly. Some colors I'll probably never use, but, doggoneit, I have them. This is 18-count, meaning 18 little squares to the inch. I can't do this with my glasses on. I have to perch those on top of my head. I might be using the wrong size needle, too, but we'll see. So, watch this space. I'll post photos as I work. And for those who wonder, the last project I did, the gnome, it went to my son-in-law for Christmas. I told a bold-faced lie to Carole and David and said it was going to my friend Patt. Now, Patt was in on the lie, so, does that really make it a lie? It was to go with a book I got him for Christmas, How to Survive a Garden Gnome Attack by Chuck Sambuchino. The book is hilarious. As David put in their zen-ish garden in the front of the house, I thought it an appropriate tome. Indeed, when the book arrived at The Bookstore in downtown Glen Ellyn, where I buy all my books, Jenny looked at it and said, "Oooh, this is something Deb would like!" and then burst out laughing when she was told Deb ordered it. 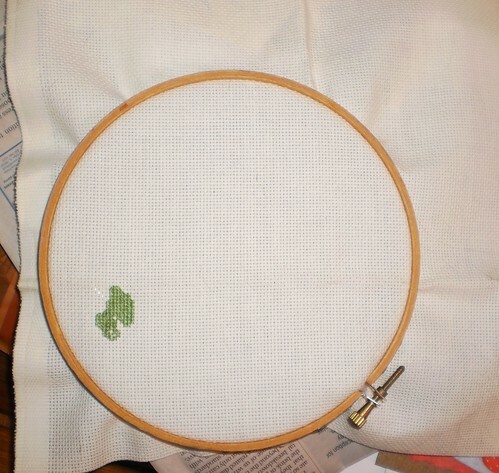 Now for appropriate stitching music, television or video.